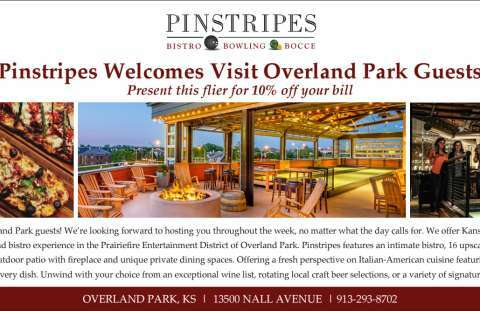 Corbin Park is among the newer retail districts in Overland Park. The retail village, which opened in 2008, is home to several national retailers’ first Kansas City-area locations. For an upscale department store experience, Von Maur offers 130,000 square feet of shopping space that includes brands like Ralph Lauren, Kenneth Cole, Nicole Miller and Donald J. Pliner. Don’t miss the clearance shoe room—yes, room!—where you’re sure to find incredible shoes at even more incredible prices. 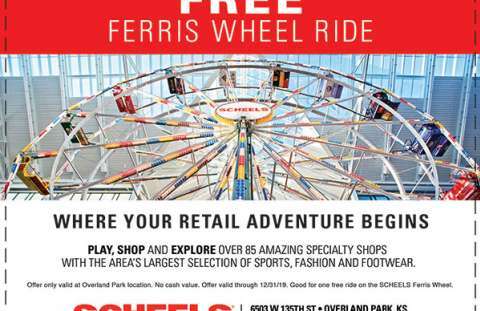 Fargo, N.D.-based SCHEELS All Sports isn’t just a must-see for outdoor and sports enthusiasts—it’s also become a go-to for family friendly entertainment. Marvel at a 16,000-gallon aquarium or hop on the in-store Ferris wheel, which towers 65 feet and includes 16 cars. Sport simulators give you a chance to test your skills in a variety of sports, including golf, hockey, baseball and football. And if you need to stop for fuel, enjoy a gourmet sandwich, fudge, gelato or coffee. SCHEELS is also home to several specialty shops that feature gear and apparel for running, hunting and fishing. Other Corbin Park highlights include Sprout’s Farmers Market, Orangetheory Fitness, Ulta and JCPenney. Corbin Park is home to several delicious restaurants, too. Try the cold-pressed juice blends at locally owned Simple Science Juices, or savor authentic Neapolitan pizza at SPIN! Pizza, also home to a gelato counter.